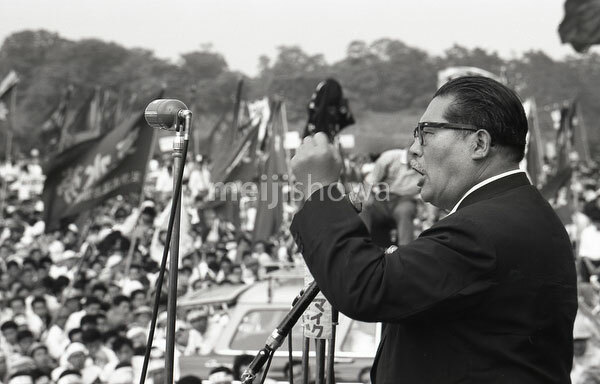 Socialist Party leader Inejiro Asanuma (浅沼 稲次郎, 1898– 1960) at a rally in Tokyo during the 1960 (Showa 35) protests against the Treaty of Mutual Cooperation and Security between the United States and Japan (安保条約). Asanuma was assassinated by a nationalist on October 12 of the same year while speaking at a televised political debate in Tokyo. 160101-0012-BR - Security Treaty Protest | 160101-0014-BR - Marunouchi "Londontown"